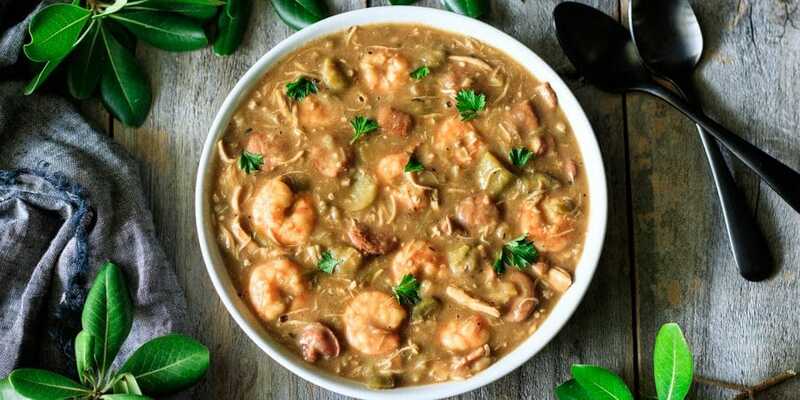 Enjoy the taste of Louisiana and learn the secrets to awesome gumbo with this recipe. 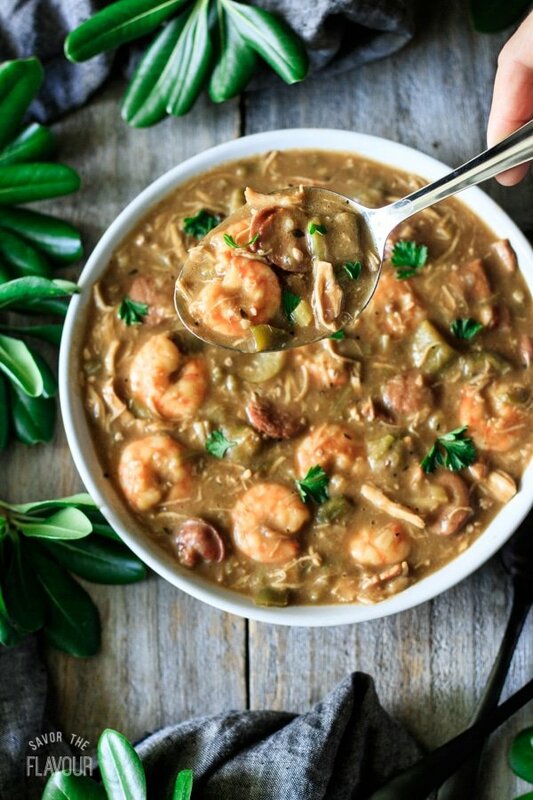 Shrimp, sausage, chicken, a dark colored roux, and spices flavor this rich New Orleans stew. All your relatives will be wanting you to make this for family dinners! Do you love to eat gumbo? If so, here’s a recipe that tastes amazing, and includes the techniques and pro tips that chefs use. Keep reading to find out! How do you thicken gumbo? The traditional way to thicken gumbo is to use a dark reddish brown or copper penny-colored roux. It is the backbone of gumbo and gives it a lovely smoky flavor. Okra gives gumbo a silky smooth texture and helps thicken it. Some people think that fresh okra tends to thicken better than frozen, but frozen is more readily available and convenient. Adding file powder just before serving adds additional flavor and thickening, but if you used okra don’t use file powder–it’s a cardinal sin to use both! You can always thicken gumbo by keeping the lid off and letting the gumbo simmer until it’s the desired thickness. File powder is made from immature dried leaves of the sassafras plant, which is commonly found in the eastern U.S. It’s often used as a thickening agent in gumbo, and has a unique flavor that can’t be substituted. However, it shouldn’t be added to the pot of gumbo while it’s cooking because it will make it stringy. Ideally, allow each guest to stir it into their bowl of gumbo. What kind of vegetables are used in gumbo? Traditionally, you will find the holy trinity (onion, celery, and green pepper), plus garlic. Fresh or frozen okra is commonly used when it’s not a seafood gumbo, but it all boils down to personal preference. Some people just don’t like okra because of the slime, texture, or taste. My girls and I absolutely love okra, so it’s not gumbo at our house without okra! The last vegetable that you’ll find in gumbo is tomatoes. 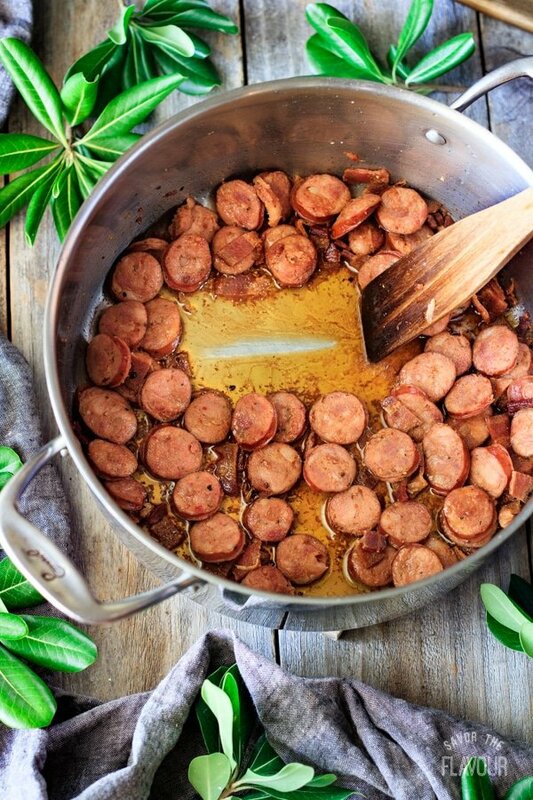 It can be used in either seafood gumbo or chicken and sausage gumbo, or you can leave it out. 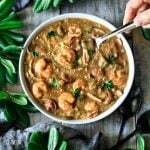 That’s the beauty of gumbo; it’s versatile and you can easily adjust it to your personal tastes. 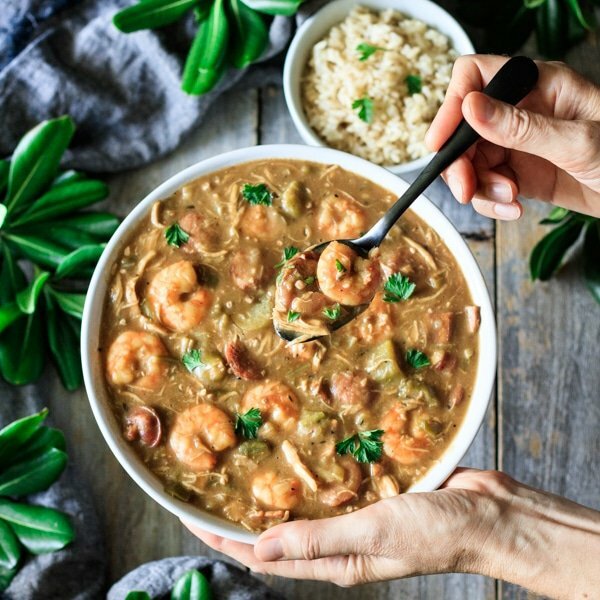 Besides shellfish, what kinds of meat can be used in gumbo? It is common to use some sort of poultry, with chicken being the most popular. A spicy, smoky pork sausage, like Andouille, is usually sliced into coins. If you can’t find the real deal, substitute with chorizo or a smoked kielbasa. Tasso, which is cured smoked pork shoulder, is popular with Cajun style gumbo. Although it is hard to find outside of Louisiana, other substitutes are smoked ham or Canadian bacon. For this recipe, I decided to used smoked bacon. The goal is to pick a meat that has a spicy, smoky flavor. 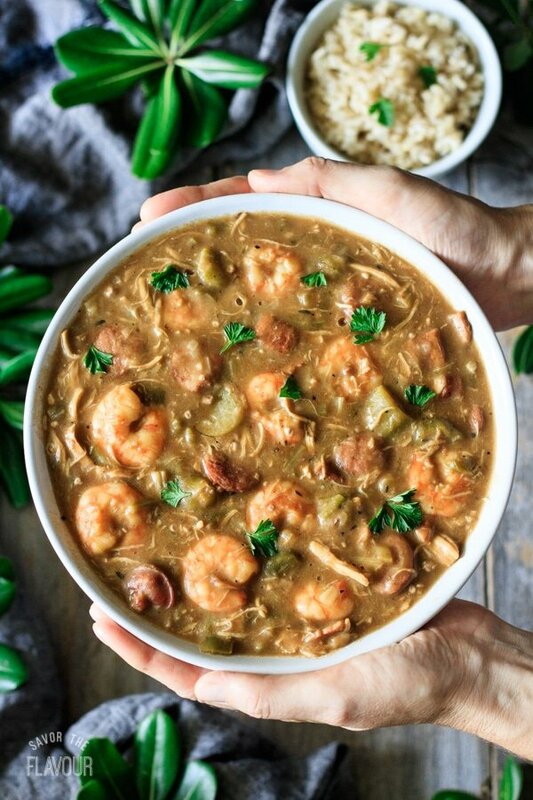 How do you make chicken, sausage and shrimp gumbo? 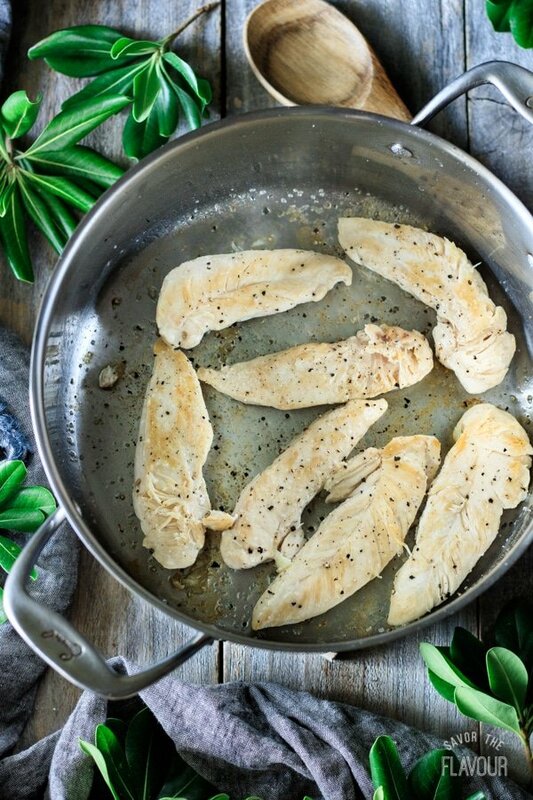 Start by browning your chicken in olive oil then transfer to a plate. Once it cools, shred it with a fork. Cook your coined sausage and cut up bacon next. Put the cooked chicken, sausage and bacon aside or in the fridge while you make the roux. 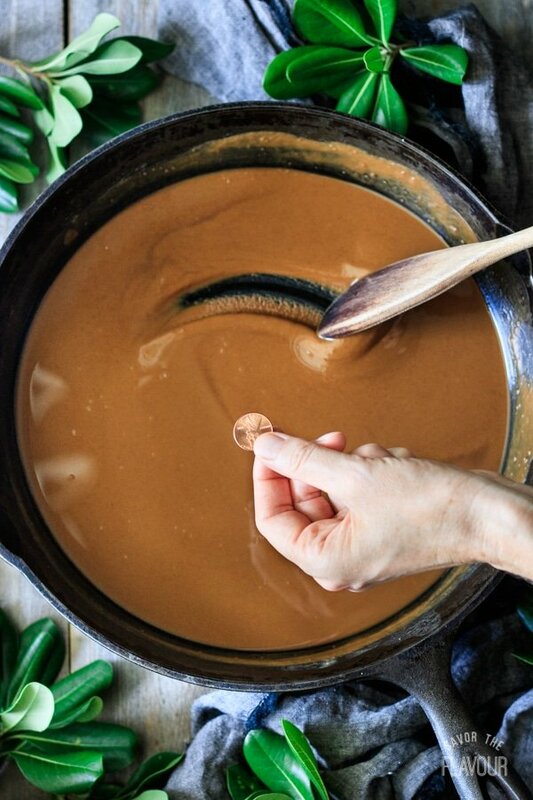 Take your time making the roux, since this is a crucial step in making mouthwatering gumbo. Get the step-by-step photos and lots of helpful tips in my recipe for roux. Since I made my roux earlier in the afternoon, I transferred the roux from the cast iron skillet to my heavy bottomed stainless steel pot before cooking the onions, celery, green pepper and garlic. Next, pour in the seafood stock. 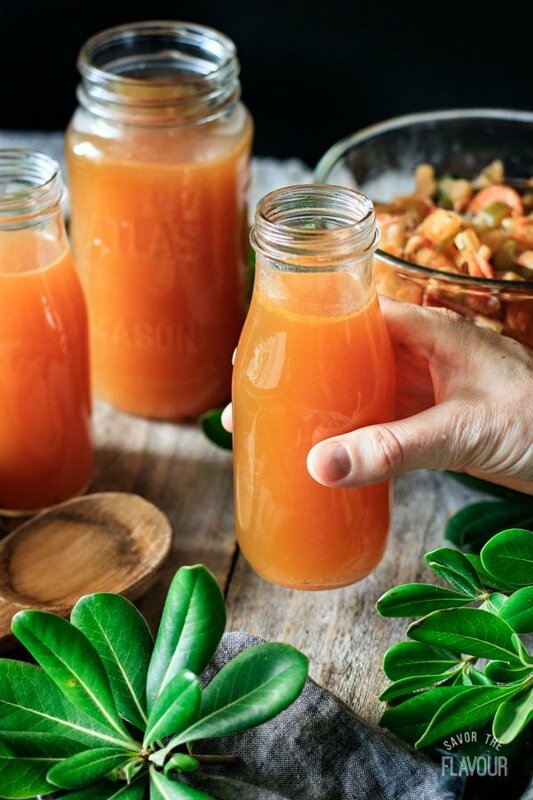 For this recipe, I used homemade shrimp stock. I share step-by-step photos and the recipe for shrimp stock here. Continue making the gumbo by adding the okra, spices, and half of a lemon. Bring it to a boil, then reduce the heat and simmer for 30 minutes, stirring occasionally. Remove the lemon, then add the shrimp, hot sauce, and black pepper. Stir and adjust seasonings to taste. Take your time making the roux. A dark roux is the backbone of gumbo; it thickens it and gives it a smoky flavor. Use the holy trinity (onion, celery, green pepper). Choose between okra or file powder as additional thickening agents. 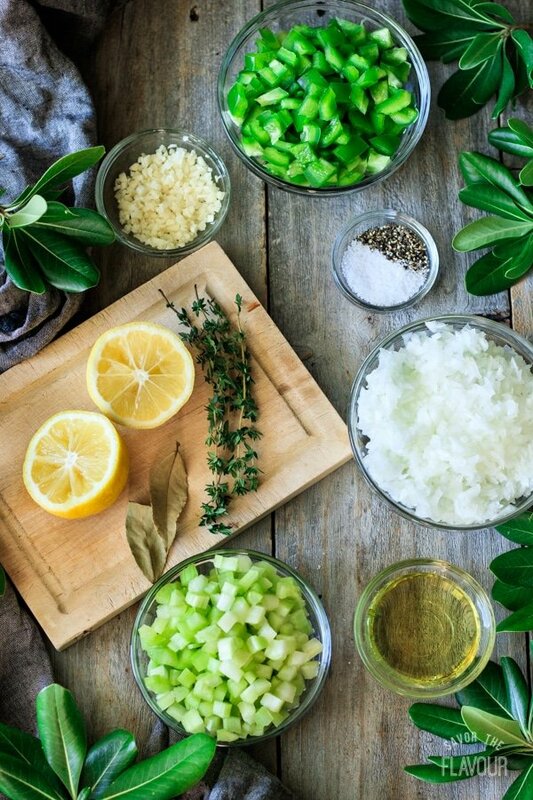 Add a unique blend of spices to your taste. Add shellfish (shrimp) at the end. Garnish with parsley and or green onions. Let each guest add hot sauce or file powder to their own bowls. Now that you brushed up on your gumbo making skills, I encourage you to make up a big pot to share with your family and friends. 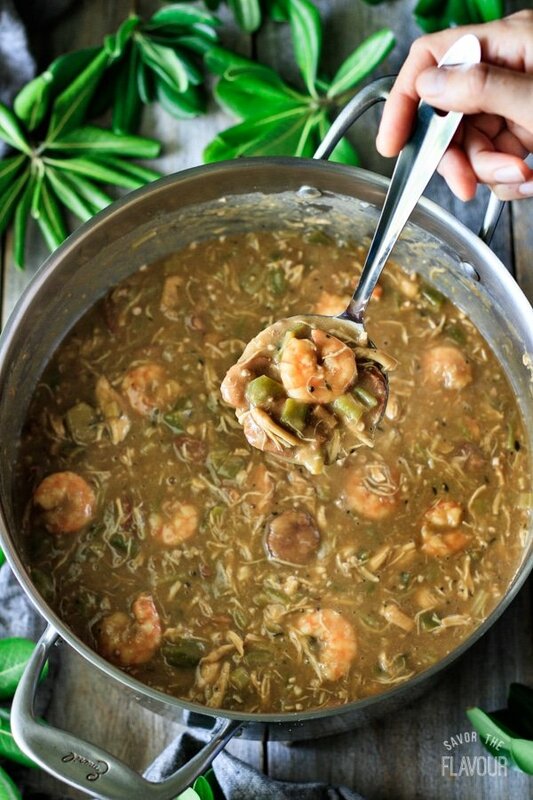 You don’t have to wait for Christmas or Mardi Gras–gumbo tastes good any time of the year. Note: This was the final post in a three post series. You’ll want to check out Part 1: How to Make Seafood Stock and Part 2: How to Make Roux for Gumbo for more top tips. Craving more Creole cooking? Check out these delicious recipes. 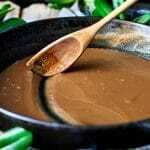 How to Make Roux for Gumbo: this easy roux is one of the secrets to fabulous gumbo. Creole Red Beans and Rice: this easy comfort food dinner is cooked low and slow for the best flavor. 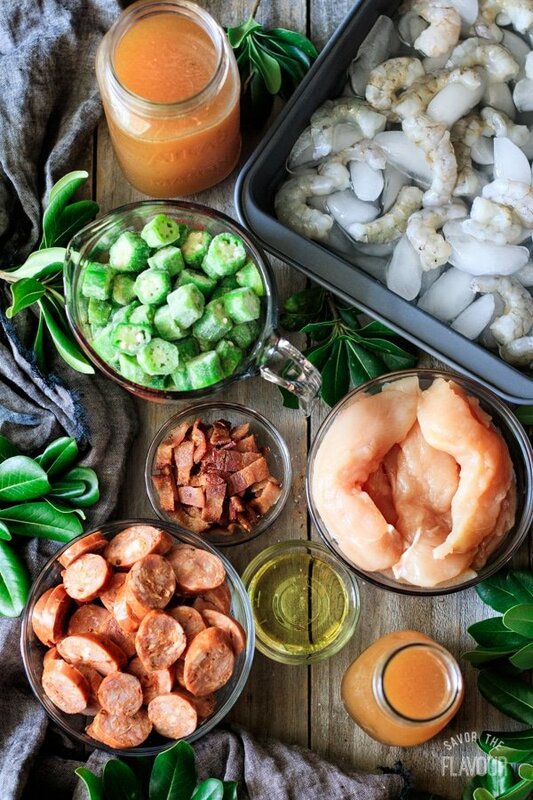 One Pot Creole Jambalaya: a flavorful dinner packed with Andouille sausage, chicken, and juicy shrimp. How did you make this gumbo? The pleasure of a 5-star rating on this recipe would be appreciated. Heat the olive oil in a heavy-bottomed pot over medium high heat. Brown the chicken breasts, turning over once. Once browned, remove from the heat and place on a plate. Once the chicken has cooled, shred with a fork. Add the bacon pieces and coined sausage to the pot, and cook until the fat is rendered from the bacon and the sausage is slightly brown. Remove from the heat and place on a paper towel-lined plate to cool. In a 10-inch cast iron skillet, heat the fat (lard) over medium heat, whisk in the flour, and stir constantly until the roux turns a deep copper color, about 45 minutes. Check out my recipe for making roux for gumbo to get step-by-step photos and many helpful tips on this important step. 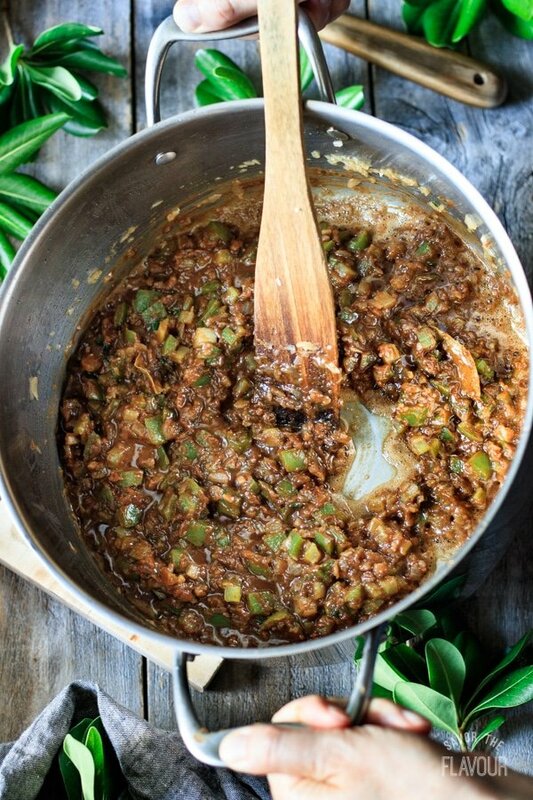 Transfer the roux to a heavy-bottomed pot and add the onion, green pepper, and celery. Stir and cook over medium high heat until it starts to soften, then add the garlic and cook until fragrant. Pour in the seafood stock and add the sausage, bacon, and shredded chicken. Stir until well combined, then mix in the sliced okra, fresh thyme, bay leaves, and half a seedless lemon. Cover and bring the gumbo to a boil, then reduce the heat and simmer for 30 minutes. Remove the lemon, then add the shrimp, hot sauce, salt, and black pepper. Stir and cook for 5 more minutes, then adjust seasonings to taste. Garnish the gumbo with chopped fresh parsley. Serve over hot rice. Gumbo tastes even better the next day. It also keeps well in the fridge for a few days, and can be frozen. To make this quicker and easier, make the seafood stock and roux ahead of time. You can even brown the meat in advance. — I would like to add that it is important to add the stock slowly (ladle-by-ladle is best). Beware of adding cold stock! Heat it, then add slowly. John Folse taught me how not to break a roux. — It’s not an either-or for me at my table. Okra goes into the gumbo. File on the table. — I use chicken thighs in addition to the white meat for a richer flavor. Cheating tip — Organic rotisserie chicken. — Works just as well with chicken stock if fish stock not possible. If I’m using rotisserie chicken and don’t have time to make a stock, I use Kirkland Organic chicken stock that I augment with a quick stock I make from roasting the bones and adding a bunch of aromatics and peppercorns that I simmer while I’m prepping the veggies and making my roux. — Yes, it’s uncommon to mix seafood and chicken in gumbo, but not unheard of. Rules were meant to be broken and that’s how we get new dishes. In any case, Jambalaya is a blend of seafood and meat. Thank you, Suzanne, for your review and tips. I’m glad you enjoyed the gumbo! Thank you, Alicia! Crab in gumbo sounds really delicious! Crab would be a yummy addition! When do you add the okra? Thanks for asking, Kacy! We corrected the recipe. Add the okra to the gumbo in step 2, along with the spices and lemon. Enjoy! Are you adding 3/4 cup of lard to the fat you rendered from the bacon and sausage to make the roux? Or do you throw away the bacon grease and sausage grease and just use lard? I am from New Orleans and although I am sure this is yummy, we do not mix seafood and chicken gumbo. But thanks for sharing! I’m glad that you enjoyed reading this post!